The Boa Constrictor (Boa constrictor) resides in the Rainforests of Belize, Northern Mexico and Argentina in South America. 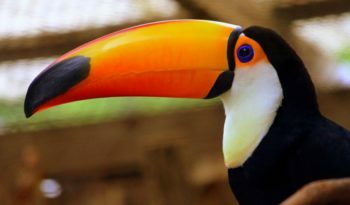 There, it is known as ‘Wowla’ to the natives of Belize. Boa Constrictors can been seen throughout the forest and sometimes in off shore caves. Boa Constrictors have two subfamilies: ‘Boinae’ or true boas and ‘Erycinae’ or sand boas. Pythons are sometimes classified as a subfamily of Boidae, but are frequently listed under their own family, ‘Pythonidae’. Sand boas are also frequently listed under their own family, ‘Erycidae’. Boa Constrictors vary in colour from a pinkish brown to grey with distinguished markings called ‘crossbands’ along their body. The Boa Constrictor is the largest snake in the Belize Rianforest, reaching an amazing length of 12 feet from head to tail tip. Boa Constrictors have large curved teeth which are used to grasp prey in. The longest ever recorded Boa Constrictor is said to have been 18 feet long, thats over 3 times as long as you or me if you are about 5 feet tall. Female Boa Constrictors are usually larger than males. Boa Constrictors contain many subspecies based on locality. The Boa Constrictors from the Amazon Basin are the most colourful, possessing bright cherry red tails. 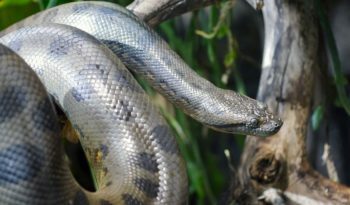 It used to be said that boas were New World Snakes and pythons were Old World Snakes, but, with boas found on Madagascar, Fiji and Solomon Islands, this is not quite true. 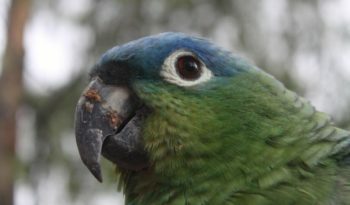 Instead, it is possible that boas have survived in evolutionarily isolated areas. 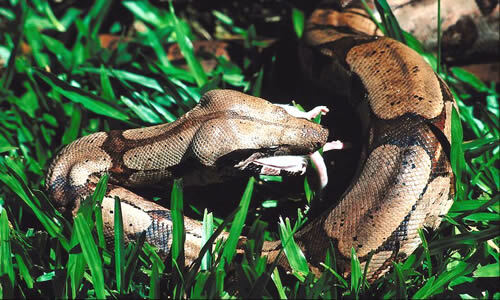 Boa Constrictors easily populate areas where there is food such as rodents and songbirds. Boa Constrictors will also feed on lizards, small mongoose, bats, rats, squirrels, iguanas and other small mammals. 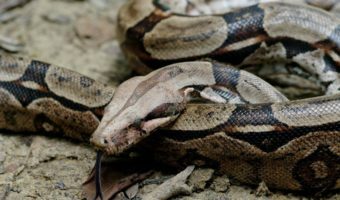 The Boa Constrictor has no venom unlike many other snakes, but when threatened they will hiss and strike their opponent, their bite can be very, very painful. Boa Constrictors use constriction to suffercate their prey. When the prey has been suffocated the Boa eats it whole. It can take several weeks for a Boa to digest its food completely. Boa Constrictors use ‘heat sensitive pits’ on their heads to sense their surroundings because they have bad eyesight. Boa Constrictors are seasonal breeders. 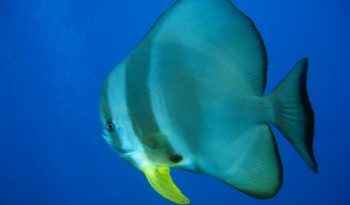 The female of the species can give birth to as many as 50 young at any one time. Unlike many other reptiles and snakes, they give birth to live young instead of laying eggs. Snakes of the subfamily ‘Boinae’ are found in Madagascar, Papua, Pacific Islands and the Neotropics. It has been suggested that genera within each of these particular areas do not form monophyletic groups (groups consisting of an inferred common ancestor and all its descendants). Compared to true boas, erycines are quite small, with most members remaining well under a metre in length. Fossil erycines have been found in rock strata over 50 million years old and were once widespread in North America. 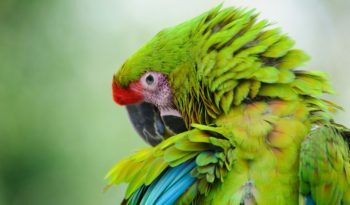 Now, only two species remain in North America, as well as the sand boas in Africa, Asia and southeastern Europe. At least three erycine species lay eggs: the Calabar Boa, (Calabaria reinhardtii) (once classified as a python for this reason), the Arabian Sand Boa, (Eryx jayakari) and the West African Sand Boa, (Eryx muelleri).